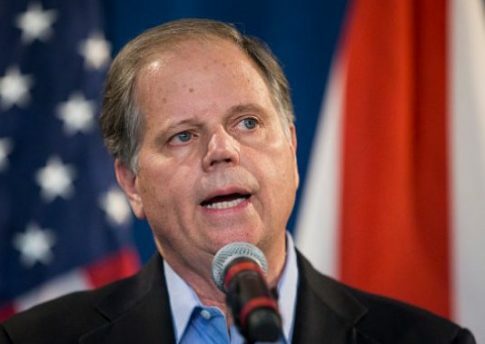 Sen. Doug Jones (D., Ala.) announced in a Twitter thread on Thursday that he will support President Donald Trump's nominee William Barr to be the next attorney general. "After thorough consideration, I have concluded that Mr. Barr is qualified for the position & his record strongly suggests he will exercise independent judgment & uphold the best interests of the DoJ. I will vote to confirm Mr. Barr as AG of the United States," Jones wrote in one tweet. The Senate Judiciary Committee voted on Thursday along party lines to advance Barr's nomination. Jones's support signals Barr will likely be confirmed due to Republicans's majority in the Senate. If confirmed, Barr will have oversight over Robert Mueller's special counsel investigation, a fact that has raised concerns among some Democrats because of a memo Barr wrote about the probe. In the 19-page memo, Barr wrote Trump's publicly reported interactions with former FBI Director James Comey do not constitute obstruction of justice. In a statement, Jones aimed to ease the concerns some of his constituents have about confirming Barr. "Many have expressed concerns that Mr. Barr’s views of executive power, which frankly are much more expansive than my own, would place the Special Counsel’s investigation in jeopardy and that he would not commit to publicly release any Special Counsel report. However, during his confirmation hearing last month, Mr. Barr said that nothing could be more destructive to the rule of law than tolerating political interference in applying the law," Jones said in a statement. "Mr. Barr said that the rule of law is what enables us to ensure that justice is not arbitrary; that laws must be universally applied, including to our highest officials." During his confirmation hearing last month, Barr told senators he believes Mueller's investigation is "vitally important" and the special counsel should be allowed to complete it. He said the memo he released was narrow in scope and targeted a specific obstruction of justice theory "under a single statute that I thought, based on media reports, the special counsel might be considering." Jones pointed to assurances he's received directly from Barr that no one is above the law. "In my own conversation with Mr. Barr, he reiterated that no one, including the President of the United States, is above the law. He assured me that he would tolerate no level of interference with the investigation and reaffirmed unequivocally his commitment to the Justice Department’s independence. Further, while I fully support making the Special Counsel’s reports available to the public and will support legislation to that effect, Mr. Barr’s position is grounded in current Department of Justice policy," Jones said. This entry was posted in Politics and tagged Doug Jones, Trump Administration, William Barr. Bookmark the permalink.